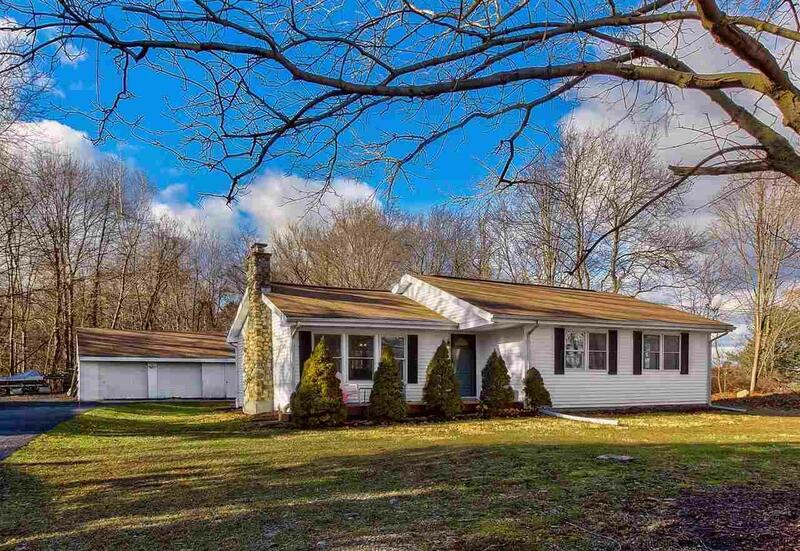 This charming and incredibly well maintained 3 bedroom, 1 bathroom New Paltz Ranch is turn-key and move in ready. Located just minutes from the Village and NYS Thruway, this home has been lovingly cared for inside and out. Sited on .55 acres, the property is peaceful and surrounded by mature trees. Enter the home through the quaint front porch leading into the living room with gleaming wood floors and beautiful stone fireplace. The kitchen is spacious with plenty of cabinets and room to cook, with a newly added coffee bar area. The kitchen flows nicely into the dining room, which is perfect for entertaining or relaxing. Ideal for easy one-level living, all three generously sized bedrooms and a renovated full bathroom are also located on the first floor. The basement is partially finished and is not included in the square footage but would be great for a game/media room or a workshop. The backyard is level and is complimented by a massive two-car detached garage. A must-see in the New Paltz school district, with low taxes at an unbeatable price!